This listing is for ONE durable 14k gold filled stacking ring. This ring is not made of thin, flimsy wire. It is designed to hold it's shape well in everyday use. These rings are made out of heavy 16 gauge wire. (The smaller the number, the thicker the wire.) These beautiful gold stacking rings can be worn singly or as a set of stackable rings. They look great when worn in everyday attire, or with more formal wear. They also look wonderful when accompanying other dainty gemstone rings. Each of these hammered gold rings have been soldered with 14k gold solder. These rings are about 1.3mm wide. 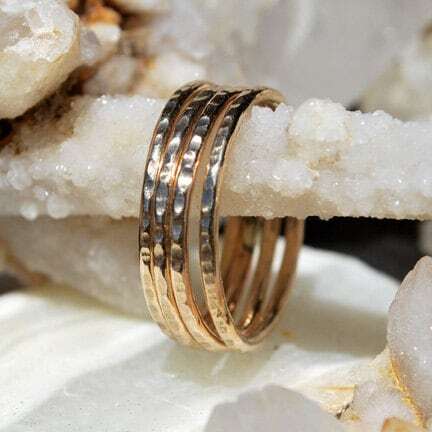 This listing is for ONE hammered 14k gold filled stacking ring. These rings have been fairly priced. There is no need to purchase 10 or 15 rings in order to get a lower price. After each of these rings have been made, they are cleaned, then polished by hand for a high luster finish. These rings would look great when mixed with my sterling silver stacking rings. I strive to provide accuracy in my photos. All photos are taken in bright natural outdoor sunlight, using a Nikon D60 camera. No manipulation of the photos occur other than cropping to make them fit nicely. Please be aware that colors will vary from monitor to monitor. Love it! Came just as pictured and also shipped fast! Thank you! I accept credit card and paypal payments only. I will refund the item's full price when returned in their original condition within 14 days. I will also refund the full price with documentation of damage during shipping. Refunds and exchanges are always welcome. I want you to be completely satisfied with your purchase. Buyer must pay cost of return shipping for refund or exchange. I ship within one to six business days. I make every effort to ship within 24 hours of an order. I use USPS First Class service as my default service. If you prefer a different method of shipping, please contact me, and efforts will be made to accommodate. I am available to do some custom orders. Please message me through Etsy if you are interested in custom work.